We are often asked what surgical products and instruments we use in our practice. The following pages include the names and contact information for the companies that supply grafting materials, instruments, fixation, imaging, etc. In combination with a thorough clinical exam, virtual 3-D surgical planning provides an accurate and precise means of attaining all treatment goals. The orthognathic surgical procedures are simulated in a virtual 3-D environment. Symmetry and accuracy of movements are compared with clinical findings and the final bony movements are registered using stereolithographic generated splint. This is an accurate, time saving replacement for traditional orthognathic model surgery. Our team with Nemotec has created a diagnosis and treatment planning software system for orthodontists and oral surgeons. Clinicians can import all 3D modalities (intraoral scans, 3D photos, DICOM data) to diagnose, virtually treat and print models and splints. FAB Software provides total control to the orthodontist and clinician. In cooperation with KLS Martin, we have developed a plate and screw system that best addresses the fixation needs of FAB treatment planning. The large advancements and counter-clockwise rotations which treat the most common skeletal-facial deformities require plates with adequate rigidity. The Arnett Orthognathic Surgery 2.0 system not only provides that rigidity but the plates are pre-formed to the anatomy of the maxilla which allow them to overlay the greatest thickness of bone in the zygomatic and pyriform buttresses. Strategically placed removable tabs allow the surgeon to hold the plate against the bone during adaptation and fixation. 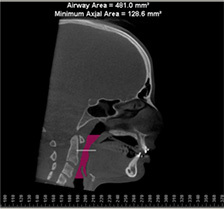 Advances in maxillofacial imaging allow three dimensional visualization of the face, the airway and the bite (FAB). Cone beam computerized tomography has drastically increased the detail and the ability to measure important structures without dramatically increasing radiation doses to the patient. CBCT permits visualization of incipient arthritic change in the temporomandibular joint, 3D localization of nerve canals and volumetric analysis of the airway. Canfield provides three dimensional photography with surface mapping. Unlike two-dimensional photography, Canfield images can be accurately measured and analyzed. We use the VECTRA H1 3D camera for our patients. FAB treatment planning often requires moving the skeleton large distances in order to overcome airway constriction or esthetic facial issues. The osseous gaps that are generated require bone grafting in order to heal and provide proper esthetic contour. An example of bone grafting benefits can be seen in the following radiograph. The radiograph shows the use of autogenous bone with resorbable hydroxyapatite from Interpore Cross and platelet rich plasma. The gap, while large, healed well without the unesthetic notching. The following is a list of companies we work with and how their individual product is used. Please see our Education Materials: Surgical Techniques section for more information. We use Dr. Arnett’s Orthognathic Surgery Instrument Set which is manufactured by H&H Company. Each instrument has been designed to maximize tissue protection, operator visualization and ease of use. The set was designed specifically for orthognathic surgery by Dr. Arnett himself. Bone graft harvesting for FAB surgical treatment is of greatest importance. We use the Osteomed Bone Harvester for punch grafts and the KLS Mx Grafter for harvesting bone from flat surfaces (nasal floor and mandibular rami). All the bone grafts are passed through the Mondeal Bull Bone Mill to achieve a consistent granule size. Oseomed provides our Surgical Power System with unobtrusive hand controls (no more searching for the pedal or dealing with unwieldy levers). The handpieces are electric and provide high torque without sacrificing tactile response. Finally, Covidien provides the Vital Vue, a three-in-one irrigation system (illumination, Frasier tip suction and sterile irrigation). The Vital Vue is indispensable for the orthognathic surgeon. In combination with orthognathic surgery, additional cosmetic procedures are necessary in order to achieve facial balance. In complete maxillary hypoplasia the high midface (malar eminence and orbital rims) lacks anterioposterior projection and requires the placement of implants. As described in Educational Materials: Surgical Techniques, a combination of Biomet’s Interpore 200 HA granules and Avitene collagen are mixed in sterile saline. The resultant putty is shaped and cured under a heat lamp. The implants provide projection and contour and are post-surgically adjustable for up to 6 weeks. The same technique can be used to provide vertical length at the mandibular angles for condylar resorption patients. Soft tissue support is achieved with orthognathic surgery, but sometimes the soft tissue itself is atrophic. The addition of fillers is sometimes required to achieve a complete functional and esthetic result.